A year after Gauri Lankesh was shot dead outside her home in Bengaluru, many other journalists continue to face death threats, attacks and false charges, Amnesty International India said on Wednesday, asserting it is a 'dangerous' time to speak truth to authorities in India. Meanwhile, a senior Special Investigation Team officer probing the murder case said the investigation is in final stage and a chargesheet will be filed in two months. The Special Investigation Team, under the leadership of Additional Commissioner of Police (West) B K Singh, has arrested 12 people in connection with the killing of Lankesh, known for her strong anti-Hindutva stand. The Gauri Memorial Trust and her supporters organised a series of events in Bengaluru to mark the first anniversary of her death. The Gauri Balaga and Gauri Lankesh Memorial Trust submitted a joint six-point memorandum to Karnataka Governor Vajubhai Vala. The memorandum demanded that Sanatan Sanstha and its affiliates be declared 'terror organisations'. Earlier, a large number of activists led by Lankesh's sister Kavitha and playwright Girish Karnad staged a march to Raj Bhavan to mark the journalist-activist's first death anniversary. 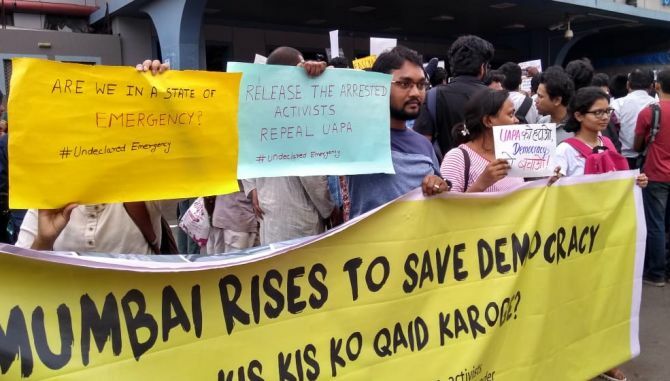 Other activists, who participated in the march, were freedom fighter H S Doreswamy, social activist Swami Agnivesh Gujarat MLA and Dalit activist Jignesh Mewani and lawyer Teesta Setalvad, among others. A 'Freedom of Expression' meet was held on the occasion. The Trust also released a pen with a photograph and signature of Lankesh. Mevani alleged that there was a connect between the killings of four progressive and rationalist writers. He also alleged that without the involvement of state machinery, such murders could not happen. Wife of late professor M M Kalburgi, Gauri Lankesh's mother Indira, and Meghna Pansare, daughter of Communist Party of India leader Govind Pansare also addressed the gathering. Writers, thinkers and journalists released a copy of newly launched Kannada tabloid Nyaya Patha during the meet. Lankesh was shot dead on the night of September 5, 2017, from close range in front of her Rajarajeshwari Nagar house around 8 pm. Amnesty International India said attacks on journalism not only stifle the constitutional right to freedom of speech and expression but also have a 'profound silencing effect'. It cited the house arrest of civil liberties activist Gautam Navlakha and Left-leaning poet Varavara Rao on charges of having ties with Maoists as examples of crackdown on free speech. 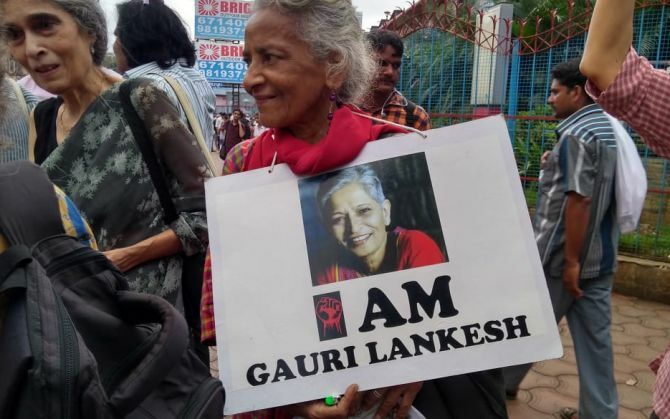 "Gauri Lankesh's death anniversary is an occasion for us to introspect on how people who expose the truth, including journalists and whistle-blowers, are increasingly under attack in India. 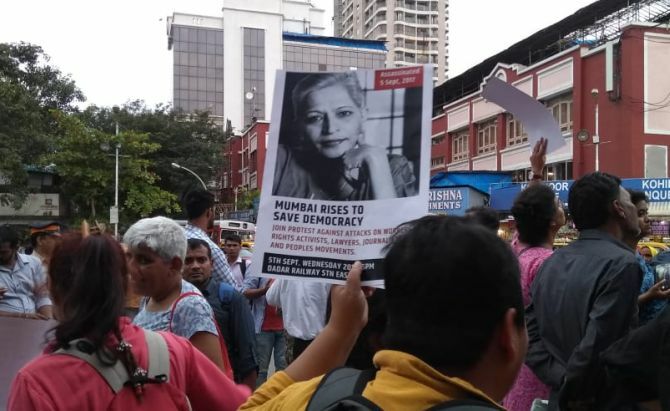 "While it is heartening that the investigation into Gauri Lankesh's murder seems to be progressing, investigations into several other attacks on journalists and whistle-blowers have yielded precious little. It is a dangerous time for anyone who speaks truth to power in India," said Aakar Patel of Amnesty India. According to Reporters Without Borders, in the first six months of 2018, at least four journalists have been killed in India and at least three more have been physically attacked. Several other journalists have received threats for journalism that is critical of the State. In August, two journalists were arrested in a nationwide crackdown on human rights defenders, Amnesty India said in a statement. "Journalism cannot be suppressed by those refusing to acknowledge the truth," Patel said, adding, "This occasion is also a good time to call for investigations into all attacks on journalists." Amnesty India said Lankesh's killing is part of a growing pattern of attacks on journalists in the country. The SIT, formed by then chief minister Siddaramaiah, has arrested suspected mastermind Amol Kale and shooter Parashuram Waghmare, among others. A few others are yet to be nabbed. Sanatan Sanstha has claimed that those arrested were not its members. Kavitha Lankesh has said rightwing outfit Sanatan Sanstha should be treated like any other terrorist organisation if its involvement in killings of rationalists, including that of Narendra Dabholkar, was proved. In a counter move, members of Hindu Vidhidnya Parishad, some of them lawyers fighting for the accused, have criticised the SIT for invoking Karnataka Control of Organised Crime Act against the accused.